Gaming with a laptop computer has just gotten a whole lot more interesting with the introduction of Alienware's Graphics Amplifier. This amplifier is a dedicated external box that can connect to a compatible Alienware laptop (there is only one at the moment) and harness the power of a full-sized desktop graphics adapter. The Amplifier box is 410mm deep, 186mm wide and 174mm tall, and it's capable of housing a single high-end graphics card from either the AMD or NVIDIA camp. You can decide on a graphics card that will suit your needs and budget. A 460W power supply is installed, with Alienware claiming that it can accommodate a full-length and dual-height card that consumes up to 375W of power. This gives it the ability to run current air-cooled, top-end cards such as AMD's Radeon R9 290X and NVIDIA's GeForce GTX 980. To install a graphics card, the Amplifier's cover lifts up to expose a PCI Express x16 slot on the chassis, and you plug it in just like you would in a regular desktop PC. The PCI Express connection is made to the laptop through a proprietary cable that ensures the Graphics Amplifier will only work with one laptop at the moment, and that is Alienware's 13. It can accommodate a full-sized, high-end desktop graphics card. The Graphics Amplifier is basically a dock that takes up less space than a PC would on a desk, and since you don't have to configure a system around it, expenses will include the Alienware 13 laptop ($1999 for the mid-range version that has a 256GB solid state drive), the Graphics Amplifier box ($349), and whatever you pay for the graphics card that you choose. You're looking at close to a $3000 outlay all up if you go for a high-end graphics card. A custom-built, high-end PC could well cost you just over $2000 on its own without a monitor and peripherals, and then you would have to decide on a gaming laptop as well. The latest Alienware 13 is the only laptop that can harness the power of the Graphics Amplifier at the moment. Since the Alienware 13 acts as the main system with the processing power, the gaming laptop with the Graphics Amplifier makes some sense as an alternative to having both a laptop and a high-end PC if you want to save some money and just use one system (that is, a laptop) for all gaming — and especially a laptop with a convenient 13-inch form factor. Indeed, Alienware has come up with the Graphics Amplifier for those of you who want a laptop for gaming, in addition to a desktop PC, but who might not want to make the extra outlay for a separate desktop PC. The Graphics Amplifier will also take up less space than a regular gaming PC would. You can use the laptop's screen, or you can attach extra screens via the card in the Graphics Amplifier. Read more Which Lenovo Yoga tablet is right for me? Of course, since the laptop's 256GB SSD isn't all that much space, if you have a large library of games, you will need to sort out storage for all your games. This is something that can be done much easier on a dedicated gaming PC with plentiful internal hard drive space. You'll want to install your favourite, most demanding games on the laptop's SSD. The Graphics Amplifier has a four-port, USB 3.0 hub on its rear, so external storage could be tapped into for games that don't require too much drive access apart from loading screens. 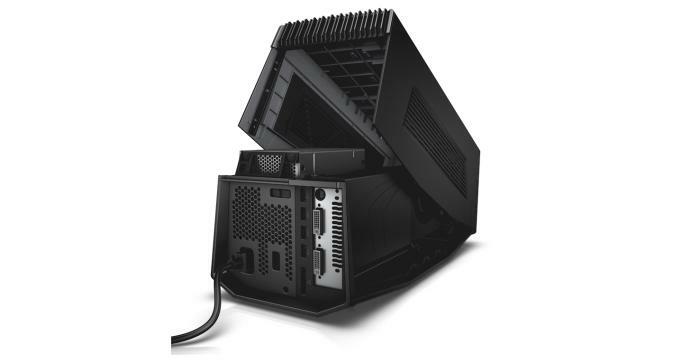 The specs of the Alienware 13 can be seen on Alienware's site. There are three models to choose from, which vary in price depending on the storage size, RAM, and screen resolution. The current Alienware 14 and Alienware 17 models do not support the Graphics Amplifier. To see if future models support the Graphics Amplifier, look in the specifications to see if they include an Alienware Graphics Amplifier Port. 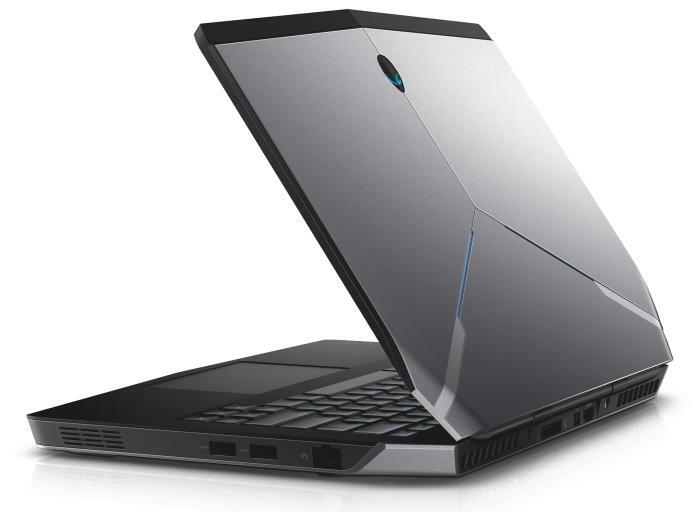 Alienware confirmed that its next generation of notebooks will support the Graphics Amplifier. However, you probably won't want to use a much bigger laptop with this type of solution. The reason the Graphics Amplifier makes sense in this instance is that it allows you to carry a relatively small and light 13-inch laptop (which has its own NVIDIA GeForce 860M graphics adapter for when you are not at home near the Amplifier), rather than having to settle for a more cumbersome 15- or 17-incher. Both the new version of the Alienware 13 laptop and the Alienware Graphics Amplifier will be on sale from 21 November.